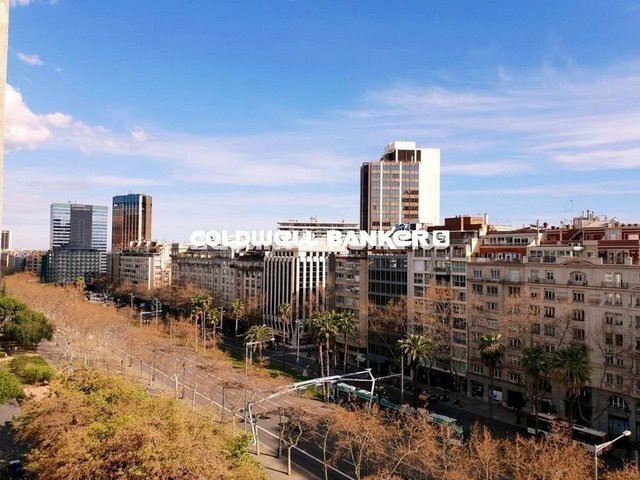 Flat to costumize at your stile , panoramic views to the diagonal avenue in Barcelona city - one of the most hightest standing neighborhood - -265 square meters built including common areas and storage- This is not a property, it is the property, your property! You will have a floor on a high floor above the rest of the farms, panoramic and clear views with orientation to the south and sun all day; You will see the sun come out from the big living room of the house, neighbors? what you see on the horizon, this property gives you privacy and offers panoramic views that few properties have. where is it? in the area of ​​turo park - doctor fleming - the best of the best in Barcelona What do you have that do not have the other properties nearby? you can condition it to your taste and current needs, later on you will be doing more things since all its interior is partition and you can adapt it to your whim. if you want 4 suites with room service, perfect or open day area with open concept kitchen and enjoy 80 square meters, forward. If the current distribution is already going well with no problem, change and put and fixed, How many meters does the property have? you have 200 square meters, well differentiated 100 m2 in the night area and 100 in the day area and in the middle the entrance to the property a generous hall with natural interior lighting, let all the rooms are with natural lighting and be on a high floor because you save on consumption, it's a big apartment What about the area where the property is located? a minute walking the leisure, swimming pool and sports area of ​​the street dr fleming, has the diagonal illa and the center pedralbes, these two minutes walk from the plaza francesc macià and the gardens of turo park also It is the central axis, business, leisure, shops of the upper area of ​​Barcelona. If you are thinking of coming with the family and are in stages of perfect learning, universities and international schools within 5 minutes, Are there medical centers nearby? Medical centers and hospitals have the most prestigious nearby and also with their own specialties. The farm has a concierge service and if you want to develop your professional activity using part of your house, the farm is mixed use so you do not have to look for an office anymore, everything for you Why is the property not reformed? because we think that it is better that you form part of your own life project and do it to your liking, without conditions of distribution, rooms, type of kitchen, space for the interim service, and choose the materials and finishes that you want. we can also help you and offer you interesting proposals with different finishing prices, follow up on the reform and keep up to date if you are traveling or you have to move the whole family. If you value that your property has to be unique, in one of the most prestigious areas of Barcelona, ​​this is yours. We are Coldwell Banker an international agency with more than three thousand offices all over the world, so wherever you are you are always connected with our company. It is the so-called blue gene. where 60 thousand agents can help you with your housing needs. managing office Coldwell Banker Open Home, Sitges Town Barcelona coast.